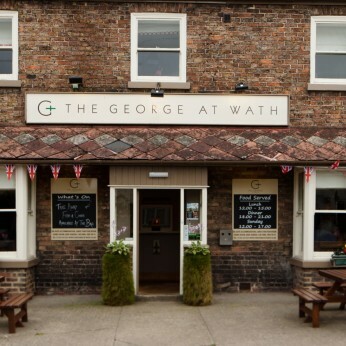 The George at Wath is an independent family run pub in the heart of a beautiful village. Offering excellent locally sourced produce and beers, it is a must visit whilst in Yorkshire. The George at Wath, situated in the beautiful county of North Yorkshire, offering beautiful scenery and a stunning coastline, is an ideal spot for a relaxed Sunday afternoon or a night out with friends. Try this very country pub with the log burning stove and a mix of oak and flag stone floor featuring a cosy and relaxed atmosphere where you can enjoy a pint of beer. If you are looking for more of a formal set up, you can venture a step into the elegant and intimate restaurant serving an imaginative menu of pub classics, and enjoy a wonderful meal. Autumn was made for cosy nights in country pubs, so why not join us for our daily Happy Hour to get you through these dark evenings at the George at Wath. Get yourselves down this Sunday for November's Quiz Night, expect lots of trivia, laughs and nibbles. Quiz starts at 7:30pm, only £1 entry and prizes for 1st and 2nd place.